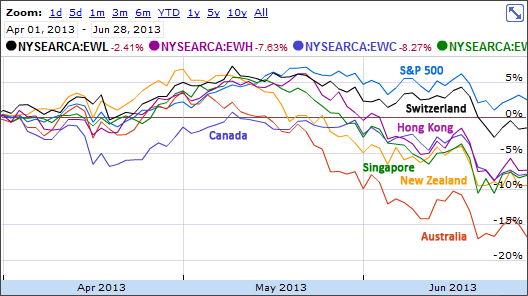 While the S&P 500 did reasonably well during the second quarter of 2013, the global markets did not. The movements in the chart at the top show capital movements without any consideration of dividend payments. iShares MSCI Switzerland Capped ETF (EWL) was down 0.35% during the second quarter, but still averaging 11.09% for the last 10 years. iShares MSCI Hong Kong ETF (EWH) was down 4.79% during the second quarter, but still averaging 12.44% for the last 10 years. iShares MSCI Singapore ETF (EWS) was down 6.61% during the second quarter, but still averaging 14.44% for the last 10 years. iShares MSCI Canada ETF (EWC) was down 7.51% during the second quarter, but still averaging 10.22% for the last 10 years. iShares MSCI New Zealand Capped ETF (ENZL) was down 8.18% during the second quarter, but still positive 21.16% for the last year. iShares MSCI Australia ETF (EWA) was down 14.02% during the second quarter, but still averaging 12.49% for the last 10 years. iShares Core S&P 500 ETF (IVV) was up 2.90% during the second quarter, but only averaging 7.23% for the last 10 years. Diversifying your assets outside of the United States is part of protecting your assets against all being subject to a single country’s economic failure or success.